The Wilderness Training Website is back! Find out about mountain guide schools now! First of all, we have to offer our sincere apologies for the lack of updates in the past year. The Ranch has been as busy as ever with the Pack Trip, Wilderness Adventure, ESL, Hiking and Mountain Guide Schools Seasons as well as undergoing some exciting new internal changes. But now that things have settled we are fully committed to keeping you up to date with all the new opportunities we have on offer and with all of the challenges our guests, students and staff have successfully overcome. Below is a quote from Henk, a student form the Netherlands who took part in the Angling Guide Program this year. He really hit the nail on the head with this one, and we have to admit, we couldn't have said it any better ourselves. "I once read that a fish in a small bowl stays small, and a fish in a bigger bowl grows twice as big. I believe the same goes for humans. If you keep learning new skills, you keep growing bigger as a person." "Change can only happen when you go out of your comfort zone and challenge yourself." 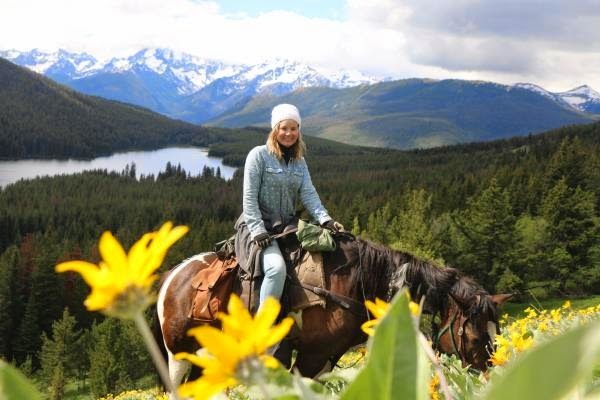 It is not only the challenges that can change a person, re-connecting with nature in it's purest and finest form as it can be found in the Chilcotin Mountains, is a truly spiritual experience. Our mountain guide schools offer you the chance to overcome old obstacles and be a confident, driven, and happy person. Picture yourself on your trusty horse relaxing in a green meadow, surrounded by a sea of vibrant wildflowers, looking out at the still snow covered peaks that are only topped by the endless blue sky above. Ride out into the wilderness, past rushing rivers filled with salmon and cross ridges alongside a mountain. Guide schools give you the potential to be who you want to be. What better way could there be to connect with nature and find your inner peace and freedom? Come and join us in this unique wilderness setting, learn the necessary wilderness and guiding skill in our mountain guide schools that may one day allow you to lead your own group up those flowery meadows or up to the icy mountain peaks!